Underage Drinking among youth poses enormous health and safety risks. Alcohol is the most widely used substance among America’s youth, and the consequences of underage drinking can affect everyone— regardless of age or drinking status. As members of society, we all feel the effects of the negative behavior, property damage, injuries, violence, and deaths that can result from underage drinking. The problem of underage drinking is not only a nationwide concern, but it’s a real problem within the state of Maryland and an issue in Baltimore City that we cannot afford to be ignored. Underage Drinking Statistics in the U.S.
Young people ages 12–20 reported that they drank alcohol beyond “just a few sips” in the past month. People ages 12 through 20 drink 11% of all alcohol consumed in the United States. Although youth drink less often than adults do, when they do drink, they drink more. That is because young people consume more than 90 percent of their alcohol by binge drinking. Drinking alcohol and binge drinking become more prevalent as young people get older. Starting to drink alcohol in early adolescence or younger is associated with a greater likelihood of developing both problem drinking in adolescence (Warner et al., 2007) and alcohol abuse or dependence in adulthood (Hingston et al., 2006). Binge drinking is a pattern of drinking that brings blood alcohol concentration (BAC) levels to 0.08 g/dL. Typically, this would occur after 4 drinks for adult women and 5 drinks for adult men, in about 2 hours; however, blood alcohol concentration levels raise higher and quicker in youth. According to the CDC’s 2015 High School Youth Risk Behavior Survey, 13% of high school students in Maryland surveyed said they have drank five or more drinks of alcohol in a row (within a couple of hours or within 1 day) . Binge drinking can create serious health and safety risks, including car crashes, drunk-driving arrests, sexual assaults, and injuries. In addition, frequent binge drinking, over a long period of time, can damage the liver and other organs. As children mature, it is natural for them to assert their independence, seek new challenges, and take more risks. Underage drinking is a risk that attracts many developing adolescents and teens. Many want to try alcohol, but often do not fully recognize its effects on their health and behavior. In addition, many youth may have easy access to alcohol. 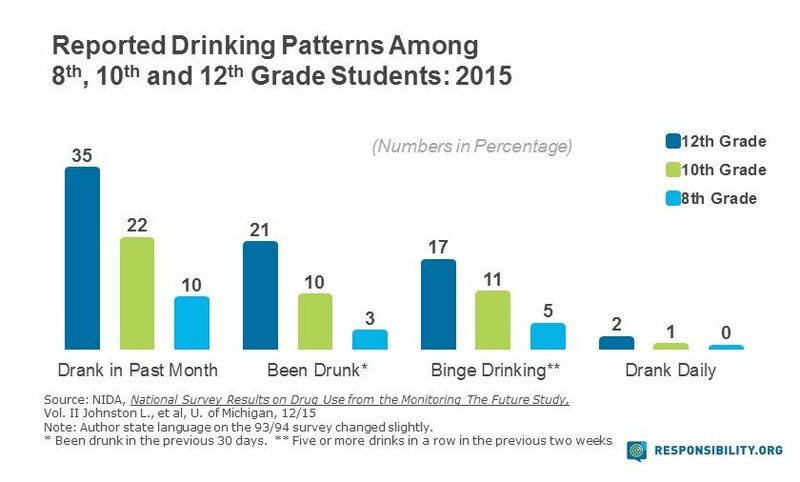 In 2015, among 12–14-year-olds who reported that they drank alcohol in the past month, 95.1 percent reported that they got it for free the last time they drank. In many cases, adolescents have access to alcohol through family members, or find it at home. Hingson RW, Heeren T, Edwards EM. Age at drinking onset, alcohol dependence, and their relation to drug use and dependence, driving under the influence of drugs, and motor-vehicle crash involvement because of drugs. Journal of Studies on Alcohol and Drugs. 2008;69:192–201. Warner LA, White HR, Johnson V. Alcohol initiation experiences and family history of alcoholism as predictors of problem-drinking trajectories. Journal of Studies on Alcohol and Drugs. 2007;68:56–65. Take a stand to make Baltimore a drug-free community – one youth at a time!